The criminal justice program at Bunker Hill Community College results in an associate in science degree. Graduates can either enter the workforce right away or use their AS degree as the foundation for a full bachelor's degree. Those who chose to transfer to a four-year school, however, should follow recommendations for AA degrees. Graduates should be prepared to work not just in local and state law enforcement and corrections agencies, but in some federal entities, as well. The college is accredited by the New England Association of Schools and Colleges, Inc., through its Commission on Institutions of Higher Education. There are two possible concentrations in the Mount Wachusett Community College criminal justice program: corrections and law enforcement. The corrections track focuses on offender counseling and rehabilitation. The law enforcement track focuses on investigations, administration of justice and community policing. Both concentration enable graduates to enter the workforce, continue on to a bachelor's degree or pursue an eventual career in law. No matter the concentration, students will enjoy seamless transfer to one of the many four-year schools MWCC has partnerships with in the area. All courses are taught by faculty who worked in the field, and coursework is supplemented with guest lectures and networking opportunities. Graduates will complete the Holyoke Community College criminal justice program with a firm understandings of the basic functions of the American criminal justice system. The program results in an associate in science degree, which should qualify graduates for entry into the workforce. It should also satisfy the requirements for the first two years of a four-year degree. Distance learners can pursue the degree online, and classes are also offered on weekends, at night or in a blended format. Students have access to a wide range of academic tools, including the library's databases, ebooks, films, journals and articles. The criminal justice program at Massasoit Community College has a day program, which draws mainly new students right out of high school, and an evening program, which attracts mostly working adults. Graduates will be eligible for work at the state and local level, as well as in one of the 21 federal law enforcement agencies. There are two associate degrees available. One is for a career track, and another is for students who plan to transfer. Academic resources include advising and counseling, transfer services and the TRiO program, which is funded by the U.S. Department of Education. Cape Cod Community College offers an associate of science degree in criminal justice, which prepares graduates for a variety of positions within the field. Graduates may also transfer into a baccalaureate program. The campus maintains the Life Fitness center, which offers recreation, a gym, intramural sports, and fitness and wellness programs. Other student services include transfer counseling and student wellness counseling. Among the many cultural enrichment offerings are the Higgins Art Gallery and Grossman Commons, which hosts music, dance and other concerts, as well as seminars and programs for things like meditation and Thai Chi. Criminal justice students at Bay Path University learn about enforcement, social change, and criminology, with courses in legal and forensic studies to prepare them for a career in the field. In addition to classroom studies, program participants complete internships and volunteer work to gain insight into the field while building their resumes. Graduates should be prepared to enter the workforce in law enforcement, security, corrections, or the juvenile justice system. Bay Path University also offers services to support learners, including counseling and health services. Many students choose to participate in student-run clubs and organizations as well, from the women in business club to the theatre workshop. Anna Maria College's criminal justice programs offer students several areas of concentration, from forensic criminology to law and society. Curriculum centers on an awareness of just and ethical practices, and students are guided to develop compassion that can alleviate poverty and give dignity to human life. Classes combine theory and research with clinical techniques, preparing students for a successful entry into the workforce after graduation. Field experiences are also involved in many of the criminal justice programs, with community placements that align with each student's interests. Beyond classes, the school provides students with a supportive community with student-planned activities and events, a multicultural affairs office, and a campus ministry. Boston's Suffolk University has several choices for students pursuing a career in criminal justice. Among them is an accelerated bachelor's/master's degree program that leads to a graduate degree after five years of study. At the undergraduate level, students take sociology courses with a concentration in crime and justice. Graduate coursework continues criminal justice studies, and students can choose to focus on victim advocacy or youth, crime, and justice. The school also offers a traditional undergraduate degree program in sociology with a concentration in crime and justice. Both programs include research projects for local agencies and businesses in the school's Center for Crime & Justice Research. Students in Boston University's criminal justice program study social policy, criminal court procedures, and criminal activity through part- or full-time study. The program is flexible, with space for students to choose seven electives that tailor their degree to their career aspirations. Available electives range from violence in the family to business intelligence and industrial security, with several options relating to psychology and technology. The program is offered through Metropolitan College, Boston University's division of continuing education. The school welcomes nontraditional students including career changers and those with personal or professional obligations outside of the classroom. At Western New England University, students in the criminal justice program can follow a specialized track in crime and society, criminal investigation, or terrorism and homeland security. Beyond law enforcement and crime-related information, students learn general skills in communication, leadership, and technology that will serve them well in any career path. During the second half of the program, students participate in internships and field work at local criminal justice-related agencies. In the past, these have included state and federal courts, correctional facilities, police training academies, and victim advocate programs. The program also has several study abroad opportunities, including a short seminar course abroad or a semester-long journey. Different students have different academic needs: some may want to study at a highly ranked program offering criminal justice while others simply want to complete a professional certificate to get out in their field as quickly as possible. 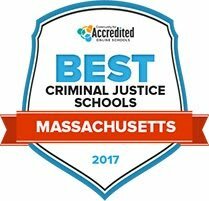 Prospective students can use the search tool below to learn about and compare criminal justice schools in Massachusetts based on a range of factors, such as academic concentrations, tuition and enrollment numbers. Because a criminal justice degree affords graduates numerous professional opportunities, it can be difficult to narrow down a specific career path. From police officer to paralegal, court reporter to correctional officer, the types of occupations and employers those attending criminal justice school in Massachusetts can explore is expansive. Take a look at some of the most popular criminal justice careers in the state to learn more about the number of people employed, the amount of money they make and the criminal justice degree level required to obtain each position in Massachusetts specifically. Before enrolling in a criminal justice school in Massachusetts, students should have an idea of where they want to head professionally-both in terms of study specialization and in terms of location after graduation. Looking and how Massachusetts compares to the national average for criminal justice job growth and salaries can help students determine whether or not the state provides the right opportunities. Scroll over the bars on the graphs below for details on how Massachusetts stacks up compared to the rest of the nation in criminal justice. Criminal justice school can lead to any number of career paths in Massachusetts, so graduates may ask: "Where can I work?" The map below highlights potential employers, along with the metropolitan areas with the greatest number of criminal justice employees in protective services and legal occupations. The Massachusetts chapter of the ACC, a professional organization for in-house legal business counsel working in the northeast U.S. The state's office that manages business initiatives, economic development, regulations and tax incentives. The state's resource for businesses seeking to expand locations or relocate to the state, the Office offers information into economic development incentive programs as well as business regulations and licensing. The secretary of state website offers business regulation information, trademark and other corporate service information for the state of Massachusetts. A professional organization with 400 members that provides professional development programs to individuals employed in the field of corrections. The agency tasked with managing the Massachusetts' correctional facilities. This site offers information on a range of career opportunities throughout the state correctional system. Open to college students interested in working in the field of corrections of Massachusetts, this site gives information on the program application requirements and deadlines. The state department that oversees juvenile justice in Massachusetts and offers resources on recidivism and youth education, as well as the Juvenile Detention Alternatives Initiative. A formal association of 170 judicial interpreters that advocates for the profession, offers membership, networking events and other resources in Massachusetts. The hub for the Massachusetts Court System online, with information on job opportunities, case and legal resources and jury information. An association for court reporters in Massachusetts that offers professional certification and resources for students. An association that works to bring together legal practitioners and youth clients that are involved in abuse, delinquency and other offender cases. The state branch of a private nonprofit organization that defends and advocates for the rights of individuals living in Massachusetts. A hub for all legal resources in the state, the Massachusetts Bar also offers a membership program for many different groups of legal professionals. An online poverty law resource that supports Massachusetts residents that need legal advice or representation. A non-profit legal services organization that provides legal assistance in civil cases to individuals incarcerated in Massachusetts state prisons. The professional association for active and retired police chiefs that offers memberships, professional newsletter, hosts events and legislative action. The state’s largest law enforcement union, the Massachusetts Coalition of Police represents more than 4,250 law enforcement officials across 157 cities in the state. For more information on training standards for Massachusetts law enforcement, including commonwealth officers, University Police and Environmental Police, visit this MPTC site. A non-profit, membership-based organization of Massachusetts law enforcement officials that advocates for police professionals through legislative policies and lobbying. A division of the state office of Energy and Environmental Affairs, the Environmental Police include the following bureaus: Coastal; Inland; Boat, OHV and Snowmobile Registration; Boat and Recreation Vehicle Safety; Environmental Crimes; Marine Theft. A public safety agency of the state of Massachusetts, the DFS provides information on the Massachusetts Fire Academy, fire investigation and emergency response. The stage agency tasked with natural resource conservation, protection, restoration and management of wildlife and fish. A non-profit affiliate of the National Environmental Health Association that provides educational and training programs for individuals working in public and environmental health. A non-profit organization founded in 1992 that promotes conservation education and information on the field of wildlife rehabilitation.